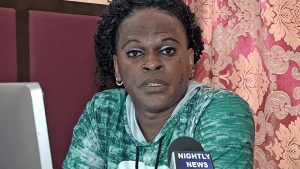 Homosexual and outspoken gay rights activist, Otis “Otisha” Pearson was Friday charged with a sexual offence he allegedly committed last year on a teenage boy. The forty-year old Pearson of 61 Station Street, Kitty, Georgetown was not required to plea to the indictable charge. City Magistrate, Leron Daly granted Pearson GY$300,000 bail and ordered that he return to court om June 19, 2018. Police alleged that Pearson, who was arrested and charged by a Woman Constable, engaged in sexual activity with a child under 16 years old. He allegedly committed the offence on December 24, 2017. The Child Care and Protection Agency of the Ministry of Social Protection Agency became involved after a photograph had surfaced showing him holding a young male.